As a startup company founder, there is extensive homework you need to do before you seek capital. Whether you are an app developer or a bio-fuel manufacturer, you need to position your company just right to secure a successful round of funding and bring your business to the next level. CPAs are an essential resource throughout the process and can help with many decisions along the way. Choosing the correct entity is critical and should be done after consulting with a competent attorney and/or CPA. There are many types of entities to choose from, such as a C corporation, an S corporation, a limited liability company (LLC) or a partnership. Each of these entities has a specific tax treatment associated with it. Many times, the choice of entity is made with the end game in mind. In other words, one should ask which entity would be the most beneficial tax-wise and how will the choice of entity impact the ability to obtain venture capital or other funding. For example, a C corporation is straightforward from a tax perspective and can be converted to an S corporation or an LLC. However, in certain circumstances, there are typically two levels of tax to pay (one at the corporate level and one at the shareholder level) when a C corporation is sold. Alternatively, an S corporation can avoid the corporate level tax and the tax would be paid at the shareholder level. An LLC is an alternative structure that has one level of tax at the LLC member level. Entrepreneurs should also consider the form of entity that the venture capital firm may require in order to do a deal. Typically, venture capital firms favor C corporations, but sometimes the existing assets have to be dropped down into a new entity that allows them to be merged into a final entity. Business owners should carefully consider how they structure the entity, as there are many issues to consider. Choosing the incorrect entity may make the deal much more difficult or may kill it altogether. Another critical component is the accounting record oversight of a competent CPA firm. Entrepreneurs should rely heavily on their CPA to make sure their books are in order before they even think about approaching a venture capitalist. When a venture capital firm looks at a potential target, the VCs typically understand that the firm is in a startup phase or working in a pre-revenue state. However, they will still want to perform their due diligence because some of the transaction terms are determined based on the type of accounting records available and their completeness. A startup company should retain the services of a CPA firm to review the accounting records and determine what issues may arise that need to be corrected before the entity is ready to meet with venture capital firms. This may take the form of having a CPA firm perform a review or an audit of the financial statements in accordance with generally accepted accounting principles (GAAP). If venture capital firms know the accounting records have been “certified” by a competent CPA firm, it typically provides a certain level of comfort. Venture capital firms want to understand how you recognize revenue and whether your revenue recognition procedures are proper for your industry and in accordance with the standards required. They also want to understand how the costs have been incurred during the startup phase and how much cash is required on an annual basis during the development stage to get the product to a sustainable, sellable state. Additionally, in some cases certain credits may be used to offset taxes that result from the sale of the company. You should consult with a competent CPA firm in this area so that they can assist you in properly capturing the credits and incentives that are relevant to you and your company. Knowing the market demands and forecasting accurate margins is also a critical step in getting your company ready to meet with a venture capital firm. One of the major considerations for VCs is whether the growth model is sustainable. Investors try to evaluate whether they will receive an acceptable rate of return on their investment. They typically have a timeline in mind, such as a three- to five-year period that it will take to earn their target rate of return. This rate of return is determined in part by reviewing and getting comfortable with the forecasting and growth projections that the company has developed. Again, a competent CPA is essential in order to help the company develop these forecasts and test them to make sure that they are reasonable, attainable and can be relied upon during the venture capital firm’s due diligence process. Once the I’s are dotted and T’s are crossed, your startup is in the game. However, there is still considerable work you need to do if you intend to play at a level that VCs will deem investment-worthy. Showing that your company has developed a robust intellectual property and patent strategy is also a necessary step in this process. Your patent portfolio is extremely important to your future success. For VCs looking to invest in the next Apple or Microsoft, knowing that the company holds patents and proprietary intellectual property is critical. Entrepreneurs have to be able to show that they have the “secret sauce” that differentiates them from all the other companies in their space. They need to be able to provide a compelling argument that their patents and intellectual property are highly sought after, viable and would provide the venture capital firm with a strong platform for growth. Companies must master this major step because intellectual property is likely one of their most important assets. In order for a startup company to do this, they must align themselves with competent counsel to ensure that they can and have developed a strategy for patenting their technology and protecting it. 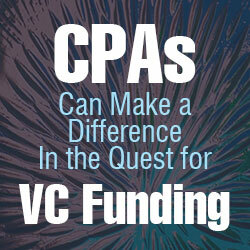 Founders should seek advice from a CPA firm and/or law firm in this area. Typically, a well-connected CPA can provide good advice in selecting the proper counsel. A good marketing strategy is also critical to this process. Once the intellectual property and the product are developed, entrepreneurs must employ a detailed go to market strategy. Venture capital firms want to be sure that you have devoted the necessary time and effort into solidifying this strategy so you can turn your product research and development activities into sustainable revenues. One way to show this is for a company to cite specific clients and companies they have been in contact with about their product. Purchase orders from large companies are very valuable to the venture capitalist and help to show the viability and sustainability of a long-term revenue stream. Public relations and strategic storytelling are important aspects as well. Not only does it help an entrepreneur to have a sizeable media presence and digital footprint when he or she is trying to woo investors, it is sometimes necessary to seek the help of professional writers who can effectively articulate why an opportunity poses so much value. This type of messaging is common for entities that are looking to unlock value by spinning off a particular asset group from the parent company. The more there is to explain, the harder it is to communicate it to potential investors. Many times, the venture capital firm will want to “walk in the shoes” of company management once they have partial or complete ownership. They are hopeful that efficiencies have developed in how the entity is managed and run. Relationships have been forged, and VCs typically do not want to stand in the way. Many times, if their assessment of the infrastructure is positive, they may want to operate in more of an oversight role and keep current management in place. Because of this, it is imperative that you establish the proper management team, relationships with vendors, commercial lease agreement, IT infrastructure and other critical business components. It is a strong benefit when VCs are comfortable keeping the existing infrastructure in place when they invest in your company. Another way a company can develop the proper infrastructure and obtain guidance is to be a part of a business incubator or accelerator. These organizations provide startup companies with many of the resources they need when first starting out. They provide them with physical space, conference rooms, telephone systems and laboratories as well as guidance to help the entrepreneur focus on developing and perfecting their technology or service. It typically is not easy to get into an incubator environment. The incubator will have its own vetting process that the startup must navigate to gain entry. Typically, these incubators are connected to CPA, law and communications firms as well as other professionals whom they can introduce you to along the way. Venture capital firms have been known to have deep relationships with incubators in order to be the first to evaluate new and upcoming companies. Your CPA can be invaluable in helping you make these important connections. Aggressive networking leads to valuable business connections, and if managed properly these relationships can lead to the injection of capital your startup needs. As with entrepreneurs, not all VCs are the same. Some look for immediate gains, while others are more comfortable waiting five or more years for return on their capital. Wasting time on the wrong investors can be a critical misstep because as an entrepreneur time is your most valuable resource. If you can’t turn a profit next year, don’t pitch a firm that that specializes in quick returns. The space you are in matters greatly as well. If you’re a medical device startup, don’t attempt to secure money from a private equity group that specializes in real estate. It’s also important to have a plan for your exit strategy. Some investors might want you to relinquish control, while others are happy for you to continue running your company. These tactics might seem obvious, but young business owners overlook them more than you might expect. You can research best practices online or with the help of your CPA. The more experienced your advisor is, the better he or she should be at pairing you with the proper source of funding and the appropriate resources to help you get there. With so many options for finding investors today, it’s critical to have your plan set ahead of time. 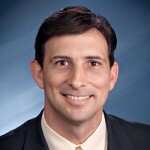 Michael Silvio, CPA, is the Director of Tax Services at Hall & Company. He has more than 25 years of experience in public accounting and tax and has served a variety of businesses in the high-technology, consumer product, software, biotech, life science, healthcare, manufacturing, construction, professional service and not-for-profit industries. He is a nationally recognized leader in the federal credits and incentives tax specialty. He has conducted over 450 research credit studies for numerous companies in various industries, and has served as a representative before the IRS and state taxing authorities to support and defend numerous research credit claims for taxpayers. Mike has consulted on many other tax incentives related to domestic production, accounting methods, federal and state grant programs, and energy/“green” tax incentives including energy efficient building incentives. Mike has assisted clients in savings millions of tax dollars with the above incentives. He also has experience in financial accounting, reporting and management, auditing, and individual and business income tax. He can be reached at ms@hallcpas.com. I really like how you emphasized that having a CPA firm work for you can really create good corporate structure and keep accounting records. Small business are growing constantly every year. They get to the point where bookkeeping gets time consuming and need an accounting firm. My business has currently grown to the point where I’m considering hiring an accounting firm. Thanks for posting this great article, it’s helped me out to make up my mind on what I need to do.